View More In Lab Detergents. 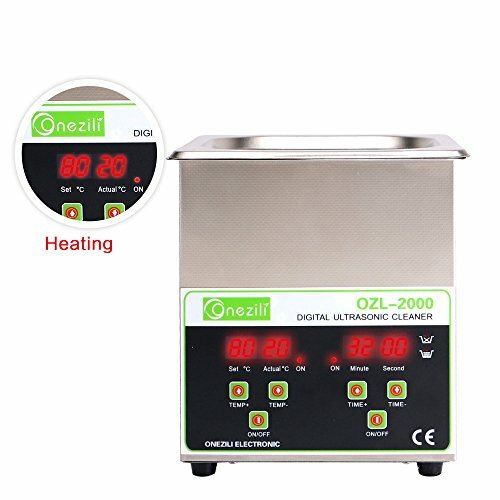 ONEZILI digital heated 2L 60W ultrasonic jewelry cleaner is professional for cleaning diamonds,dentures,metal handles,car bicycle engine parts,handguns,rifle,baffles,sunglasses, toothbrush,bolts,retainer,gemstones,watch,toothbrush,electronic tool,dental instruments,fuel filter parts,bleaching trays,bowls,necklace,nozzle,coins,jewelry,charms,minerals,cartridges,bicycle parts,eyewear,necklace,bracelets,toothbrush,teeth,crystal,gems,chain,gemstone,charms,metal watch bands,gold earrings,silver earrings,eye glasses,pens,guitar parts,pistol cases,coins,airbrush gun,diesel injectors,necklace,electric razor,brackets,pearl jewelry,readers,plaque,jewelry stones,airbrush gun,thermometer,topaz,bullets,garnets,emeralds,pieces,fingernail clippers,razor blades,fishing reels,ear rings,eyeglasses,optical parts,capacitors,carb jets,watches,gun parts,lab tools, platinum,gold,silver,gems,metals parts,brass,ear rings,tool chain,watch bracelets,rear bike cogs,cell phone boards,tattoo,contact lenses,veg,braces,airbrush,firearms,gear,dental lab works,fruit,motorcycle carburetor,cassette and chain. ONEZILI ultrasonic cleaner with 304 Stainless Steel, with basket and with dissipating heat design. Digital Timing, Adjustable Heating Function, 1-99 mins, 0-80℃. Powerful professional grade cleaning system works to remove dirt, oil & grime from your valuable items including jewelry, eyeglasses, rings, diamond, necklaces, watches, coins, razors, dentures, instruments, tools, parts & more in minutes without damaging them. Portable ultrasonic cleaning machine. With a generous 2000ml stainless steel cleaning tank; both small and large jewelry alike can be fully submerged and thoroughly cleaned using just tap water. Add detergent for enhanced cleaning. The ultrasound cleaner to be free of defects in parts, materials and workmanship for a period of 1 year. 1 Year Manufacturer's Labor + Parts Warranty. If you have any questions about this product by ONEZILI, contact us by completing and submitting the form below. If you are looking for a specif part number, please include it with your message.